We recently ran a breakdown of all the popular Netgear routers on the market today (you can read more here). As that article seems to be very popular, we thought it was time to write another. This time based around Asus. 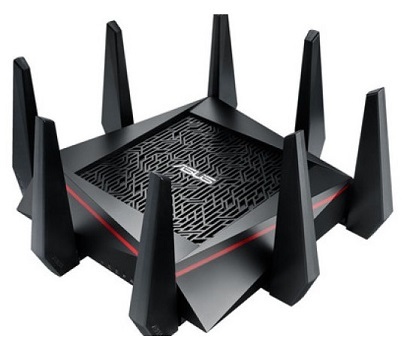 Asus have launched a couple of ‘big players’ in recent months, in direct competition with the Nighthawk range of routers. Released towards the back-end of 2015, the RT-AC88U is the follow-up to the very popular 87U. It has 1024-QAM technology (dubbed ‘NitroQAM’), boosting up wifi speeds for an improved connectivity experience overall. Are you a gamer? The RT-AC88U comes bundled with a free version of WTFast (What The Fast – Gamers Private Network). WTFast helps you crush your online opponents by routing your gaming packets across an optimized path through the Internet to your intended game servers. It also has Link Aggregation, so you can port bundle two LAN ports together as one. Doubling throughput and increasing resilience. Definitely one for the NAS crew out there! Asus’s most powerful router is here….the RT-AC5300U. Yup, that’s right AC5300 – so that’s 5.3Gbps (theoretical of course) over 3 bands (Tri-Band). Just like the RT-AC88U above, this has WTFast for the gamers. Oh, and AiProtection (virus scanning on the fly) and it’s MU-MIMO ready. The Asus RT-AC87U AC2400 router was at one time Asus’s fastest router available. It was the talk of the town a couple of years ago. And finally, we have the predecessor to the aforementioned RT-AC5300U….the RT-AC3200. This was Asus’s first venture into the Tri-Band market. Just like the RT-AC87U, it can be picked up for a bit of a bargain these days. Ok, so we lied! There are more routers for you guys to have a look at. These two (RTAC66U & RT-AC68U) are the first Wireless AC routers that Asus launched. They are still really good routers for most people out there, and once again, can be picked up a lot cheaper than what they were when they first came out! Ok, so it’s decision time. You’ve read through and considered all the various options. Lol, in all seriousness, choosing the right router can be challenging. This first thing to consider is your budget. How much are you willing to spend? If money is no object, then go for whatever you like. You may want the latest and greatest (88U or 5300U), but if you want an all-round good router, that doesn’t break the bank, then perhaps consider one of the older routers now that they’re dropping in price). And if you don’t want an Asus, you could always consider the ‘arch enemy’ and pick a Netgear router (or a Linksys/D-Link for that matter).